I first saw one of Sharon Core’s photographs from this series a few years ago, in the office of James Kelly Contemporary, in Santa Fe. The show had already passed but the gallery kept one image in the office where they could continue to enjoy it. 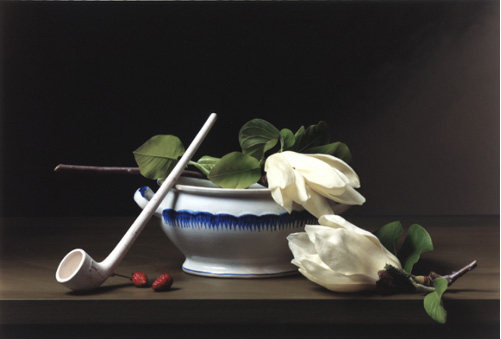 I believe it was Still Life with Pipe, and I remember thinking to myself, what a fabulous, and surprisingly quaint, painting. And then, moving closer, being appropriately wowed by the fact it was merely a photograph. The sheer sumptuousness of the image prevented me, for several minutes, from picking the photograph apart technically. I find, too often, when photographers see something impressive, we immediately want to know how it is made. We seem to find a perverse satisfaction in “getting it” and being able to explain away the magic. Maybe it makes us feel smart. So I was gratified to hear that Radius was publishing a monograph of Early American. The book is slightly oversized, simple, and elegant in design. 31 photographs are lavishly reproduced and assembled with a stitched binding, mimicking a hand-bound album. Six of the images are also presented close to their actual size in two-page spreads, the detail in the images practically assaulting the eye. The List of Plates is illustrated with thumbnail images proportionally sized with white drop shadow borders, giving the impression of viewing the images in a gallery. The List of Plates also provides information about the prints themselves; they are chromogenic prints made in the darkroom from 4 x 5 negatives, an intentional choice by the artist. Core’s images, indeed, creep out of the darkness. The objects depicted are familiar, but often just a little bit strange. They are beautiful, seductive, and occasionally ugly. I found myself poring over the small details and the contradictions, as in Still Life with Steak, in which a fat-encrusted, alien looking slab of meat is grotesquely wrapped around a carrot. It is Raphaelle Peale meets Joel-Peter Witkin. Other images are simply captivating in the fine details highlighted by Core’s seeping light. The surfaces and textures become overemphasized and disorienting, as in the glowing, pockmarked ostrich egg in the first plate, Strawberries and Ostrich Egg. The tradition of the still life has always reflected contemporary cultural mores. The opulent, lavish 16th and 17th century Dutch still life paintings reflected the material abundance of a capitalist mercantile culture. Early 17th century vanitas paintings encouraged repentance in accordance with strict Protestant ideology. While Core’s photographs are often compared to these genre paintings, I am more compelled to make a visual connection with the stripped down, early Modernist realism of Édouard Manet’s still lifes, like The Lemon, or Asparagus. Core’s photographs continue the tradition of the still life in their highly mediated authenticity. Not content to merely mimic Peale’s compositions, she literally recreates the subject matter itself. Growing the fruits and vegetables from rare heirloom seeds acquired through sources such as the Thomas Jefferson Center for Historic Plants, her investment in time and labor recalls the quotidian experience of the early 19th century. I found myself wondering if the knowledge of her process affects my viewing of the work and my experience of this book. All of this time does seem to matter. Like the current resurgence in quality consciousness, from the locavore, farm-to-table movement to the premium placed on almost any artisanal product, Core’s painstaking approach to her acquisition of objects is a reflection of contemporary cultural trends. This body of work by Sharon Core is perfectly framed by the excellent design by Radius Books and the high production value of Early American. To learn more about Lauren, please visit her website.